Adobe Captivate – a powerful authoring tool that is the darling of the e-learning development community. A survey conducted by the E-learning Guild showed that this online course development software is the most widely used rapid authoring application. This online course development software is arguably the best tool to develop responsive online courses. 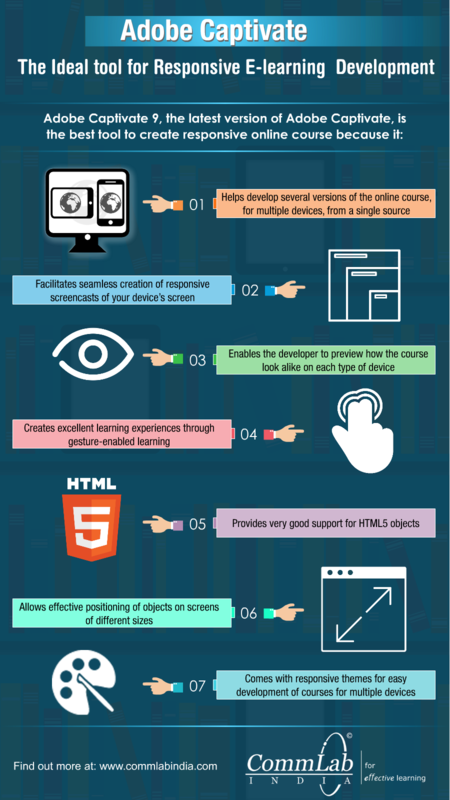 Here is an info-graphic that lists some of the responsive e-learning development capabilities of Captivate 9, the latest avatar of the rapid authoring tool. These features of Adobe Captivate 9 make it a very popular rapid e-learning development tool. However, on the flip side, the software has a few limitations. Let us see what they are. On several occasions, learners wish to re-visit an e-learning course after completing it. To facilitate this, various rapid authoring tools (including Adobe Captivate), allow the creation of courses where learners can “go back” after finishing the entire course. 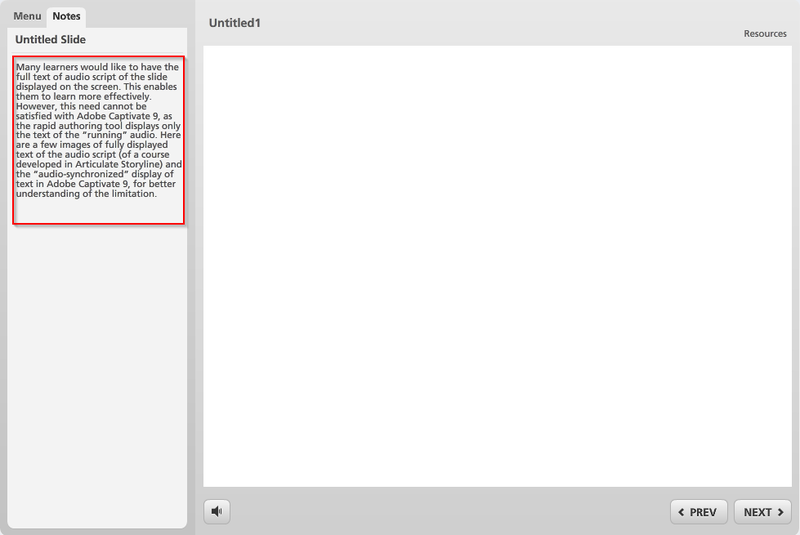 But in Captivate 9, we have noticed that the audio in the course is muted, after the learner re-visits a few slides. Here is a scenario. A learner completed a 30-slide course and then re-visited each slide by clicking the “Back” button. When he re-visited the 15th slide, he observed that the audio was not functioning. He noticed that the problem also persisted in all subsequent slides (i.e. 14th, 13th,……..1st). The problem occurred only when the course was published to HTML5 and accessed using the index_scrom.html file in the offline mode. 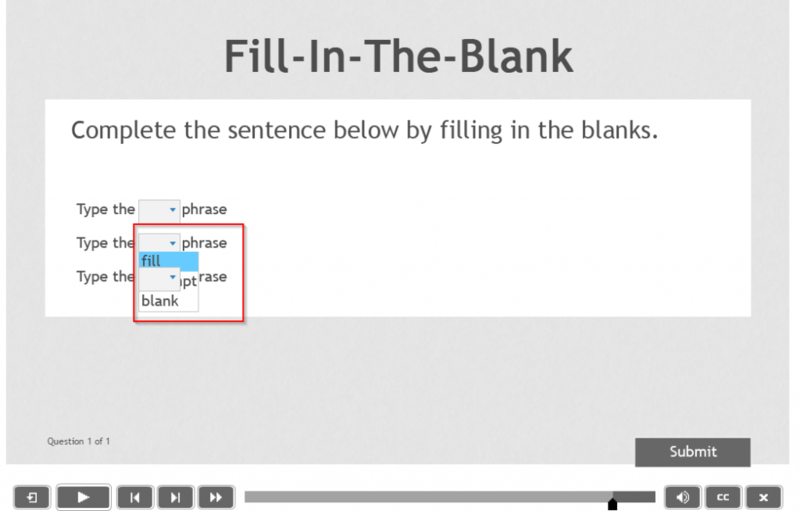 Many learners would like to have the entire audio script of the slide displayed on the screen. This enables them learn more effectively. However, this need cannot be satisfied with Adobe Captivate 9, as the rapid authoring tool displays only the text of the “running” audio. Here are a few images of fully displayed audio script (of a course developed in Articulate Storyline) and the “audio-synchronized” display of text in Adobe Captivate 9, for better understanding of the limitation. Audio files are frequently called from libraries for various purposes, such as providing feedback. However, when audio files are called from a library developed using Adobe Captivate 9, it is not possible to display the text of the audio. As a result, developers are compelled to run the audio on the timeline of the rapid e-learning development tool. This prevents developers from displaying the text of audio clips. Learners often wish to re-take the questions they have answered incorrectly. Online courses developed using Adobe Captivate 9 allow learners to re-attempt the questions. However, they need to refresh the page containing the question. This is because it is not possible to re-set the variables using this rapid e-learning development solution. You can use Adobe Captivate 9 to create questions where learners need to select the right answer from a dropdown menu. We noticed issues in the alignment of the options when the course was tested offline. However, we observed the options were well-aligned when the course was published to the iPad. Adobe Captivate 9 is a powerful rapid authoring tool that enables developers create interactive and engaging e-learning content. However, the tool has a few limitations. Audio is not played in some slides when a course is re-visited. It is not possible to display the entire audio script of a slide and the script of audio files stored in libraries. Learners need to press the “Refresh” button to re-attempt a question. The options in the dropdown menu are not aligned in a proper manner. Let us hope these problems will be resolved soon.